The impact of e-learning on higher education has been significant, with the numbers of students studying in this mode continuing to be sizeable, and the effect upon evolving pedagogies being substantial. 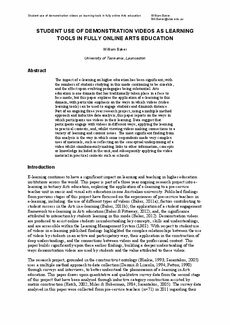 Arts education is one domain that has traditionally taken place in a face to face mode, but this paper explores the application of e-learning to this domain, with particular emphasis on the ways in which videos (video learning tools) can be used to engage students and diminish distance. Part of an ongoing three year research project, using a multiple method approach and inductive data analysis, this paper reports on the ways in which participants use videos in their learning. Data suggest that participants engage with videos in different ways, applying the learning to practical contexts, and, whilst viewing videos making connections to a variety of learning and content issues. The most significant finding from this analysis is the way in which some respondents made very complex uses of materials, such as reflecting on the conceptual underpinning of a video whilst simultaneously making links to other information, concepts or knowledge included in the unit, and subsequently applying the video material in practical contexts such as schools.